Law firms continue to compete aggressively for new clients and new work from existing clients. We know from recent surveys by Citi and Altman Weil that client demand for outside lawyers remained flat in 2016 and is expected to do so again in 2017. With the same or less work to go around, this means law firms are having to poach other firms’ clients to land new clients. And they are. 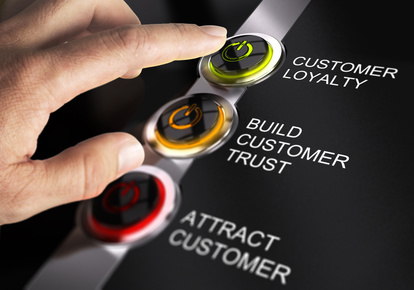 In our blog post about the link between truly loyal clients and higher profitability, Are Your Clients Loyalists or Defectors, we reiterated the importance of developing exceptionally satisfied clients that, through their loyalty, become your best sales force. Doing so reduces the opportunities for your competitors to elbow their way into the relationship. Firms have gotten much more sophisticated about engaging with clients to understand and anticipate client needs and have developed many ways of providing value, insights, information and resources to clients free of charge just to remain relevant to clients and competitive with other firms the client is in contact with. Beware – Do Not Focus on New Clients at the Expense of Existing Clients! Many years ago, I was engaged by a law firm that was interested in bringing in new business and clients to the firm. I was hired to develop a sales and business development strategy to help them do this. In order to devise a sound approach, I interviewed the firm’s partners to better understand how they had attracted the clients they currently served and why they believed that clients hired them. I also interviewed fifteen of the firm’s clients to gauge the clients’ perceptions of the firm’s value and differentiators. During these interviews, it became clear that most of the firm’s clients were only moderately happy with the quality of service and work that the firm was producing and many were already steering their legal work to other law firms. Somewhat alarmed by this, I suggested to the firm that we first focus on improving their service to clients, better understand clients’ needs and deliver stronger and differentiated value to their clients. I believed that having a revolving door where clients were leaving by the back door even if new clients came in the front door was not sustainable. The firm did not want to hear this, still wanted a focus on only selling to new clients, and I walked away from this engagement. Fortunately, most firms now recognize the value of concentrating most of their sales efforts first on existing clients, to expand their representation but first and foremost to ensure that they have loyal clients who consider them a partner in their overall legal and business strategy and also as allies and fans who refer new clients to them. Developing loyal and long-standing client relationships must be approached thoughtfully and systematically. 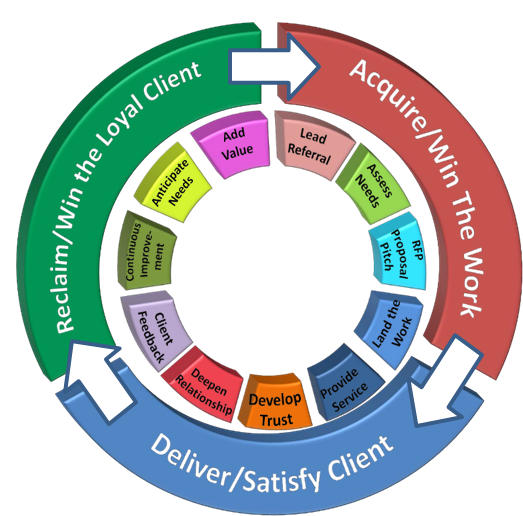 There are a number of phases and steps in building a happy client from the time the firm is retained throughout the relationship. Win the Work – Your Credibility. This is the initial phase in which a prospective client has been referred to your firm. Ideally, the referral comes to you from a highly loyal client or another relationship, but other important influencers will include your credibility and visibility as an expert in your service niche and perhaps the client’s industry and reflecting this through thought-leadership. Your connections to regulators and other industry leaders could play a role as well as your proven track record of staying ahead of the curve on issues and trends. Win the Work – Your Approach to Selling. As we wrote about in How to Sell: Stop Pitching and Start Listening and Relating, you should focus first on helping prospects, being helpful and a resource and on developing a relationship. Don’t focus on your credentials or immediately on a solution. Do your research, ask good questions and listen intently. Assess the prospect’s needs, gather intelligence and make yourself relevant and valued so you are among the first the prospect calls for insight and advice, even before being a client. Deliver Services/Satisfy the Client – Project management. The first engagement with a new client is a critical time to reassure clients they made the right choice in selecting your law firm. Extra time “off the clock” should be spent internally and with the client to conduct proper project scoping, project set-up including establish roles and responsibilities, and setting and managing client expectations. The firm must be vigilant about producing a quality work product and achieving milestones along a deliverables timeline. Budgets should be tracked and managed in real time and the team should be communicating and collaborating. Deliver Services/Satisfy the Client – The Relationship. Every client has a preference for how to work with lawyers including their interpersonal interactions. Many law firms are encouraging their lawyers to engage in personal style and communications style assessments to help them better understand the motivations and styles of their clients. Some clients will forge close professional and personal relationships with lawyers, others prefer to maintain some distance. Building a strong relationship will clients requires empathy, attentiveness and sustained effort and outreach. Win a Loyal Client – Establishing Trust. It is remarkable how many of the client interviews we conduct for law firms still reveal many clients whose top complaints about their firms or lawyers is a lack of communication and responsiveness or a high level of arrogance and “deafness” to what the client needs or wants. It is usually smart to be transparent and clear and communicate early and often. Clients hate surprises and many want to be involved in determining legal options and strategy. In addition to reliability and responsiveness, clients want their lawyers to be accountable by doing what they say they will do and making sure others on the team and in the firm do the same. This means also taking ownership for mistakes and problems. Win a Loyal Client – Anticipate, Satisfy, Nurture. Firms must be committed to continuous learning and improvement in order to strengthen long-term binds with clients. Seeking feedback consistently and formally to identify areas for improvement and then acting upon that feedback is critical to forming a partnership of trust with clients. Regular communication with clients enables lawyers to hear what is most challenging to them and to proactively provide insights on how peers are tackling these challenges. Providing value above and beyond the matters clients engage firms for is an important way of deepening loyalty. Since 70% to 80% of a law firm’s business usually comes from current or recent clients, firms’ first focus for sales should always be on ensuring that existing clients are as loyal to the lawyers and firm as they possibly can be.